When 13 Hours: The Secret Soldiers of Benghazi opened earlier this month, it arrived with a surprise teaser trailer for 10 Cloverfield Lane, which many believed was a sequel to the 2008 thriller Cloverfield, a movie that arrived wrapped in just as much mystery. 10 Cloverfield Lane has since been called a distant cousin to Cloverfield. The two films are connected, but this new thriller isn't a direct sequel. Some believe it is more of an anthology film held under the Cloverfield banner. Whatever it is, it is arriving under a shroud of secrecy this March. And like Cloverfield, it is getting an extensive and somewhat bewildering viral campaign. In a recent interview, star Mary Elizabeth Winstead teased what the movie is actually about. Speaking with EW, the actress opened up every so slightly about the tense drama, which takes place in a bomb shelter. She can't tell us much about the plot or its twists and turns. But she did reveal this. "There is this veil of secrecy to it from the very beginning. We were making this movie in this little bubble where nobody else knew what we were doing and there's really only three actors in the whole thing, so it kind of felt like this really intimate experience. Now that it's about to come out, it's sort of crazy - like, 'Oh yeah, people are excited to see this movie.' I forgot that that was going to happen." Mary Elizabeth Winstead stars in the movie alongside John Goodman and John Gallagher Jr. The actress compares making the movie to working on a play. Here's what she had to say about creating a level of tension and intimacy with her co-stars. "It's so much about just the actors interacting with each other and that tension that builds, just all wondering if they are who they say the are, if they're telling the truth or not, and really wondering what's outside. We always have the script. We know where it's all leading to. As production went on there were rewrites, as there usually are, but nothing that was major. It was always something that I knew we weren't going to be able to talk about until people saw the movie." Anyone who was online back in 2008 surely remembers the tidal wave of viral videos and goodies that constantly arrived for Cloverfield, teasing fans as to what exactly we were about to see. A lot of it didn't amount to anything substantial, and none of it made watching the movie a more enjoyable experience. But it certainly kept people talking about Cloverfield up until its release date. Cloverfield helped introduce the idea of ARGS (Augmented Reality Games) to a wider audience. And the ARG/viral marketing campaign for 10 Cloverfield Lane appears to be continuing that trend. The original Cloverfield viral campaign launched a number of websites, the most notorious one involving Slusho, a Japanese drink that was spotted on a T-shirt in the original teaser. We were also introduced to the Tagruato drilling company. They developed Slusho using a secret ingredient called 'seabed's nectar'. TIDO Wave emerged shortly thereafter as an environmental group determined to get Tagruato to stop drilling just as they opened the Chaui Station somewhere close to New York City. It was later revealed by a spy that there was no oil on Chaui Station, and that a dark secret was being housed there. This sent TIDO Wave on a search for the station, but they were too late, as it had been destroyed days earlier. Tagruato attempted to blame TIDO Wave for the destruction, calling it a terrorist attack. Teddy Hanssen's girlfriend Jamie was a member of TIDO Wave, and had attempted to document some of what Tagruato was doing. The last video she filed was the night the Cloverfield monster attacked New York, right before Rob's goodbye party. Rob, who we see in the movie played by Michael Stahl-David, was heading to Japan to start his new job with the Slusho company. And that's pretty much the backstory on the Cloverfield viral campaign. It's been almost 8 years since any of the Cloverfield ARG websites have been updated. But last night, Tagruato sent out a brand-new email to fans who had participated in the viral campaign the first time around. It reads as such. "From: [email protected] Hello, Due to new security protocols, this account is no longer active. All correspondence is monitored and will be responded to appropriately. Thank you for your interest. Sincerely, Vanessa Gwon Director of Public Relations *Employee of the Month: 2016 January." The part that reads '*Employee of the Month: 2016 January.' arrived in bright orange text, indicating that this wasn't just some generic auto-response from a long dormant website. As of yet, no further clues have been provided from this particular email. That said, the 10 Cloverfield Lane teaser does show us a bottle of what is called 'Swamp Soda'. And this product has now led to a brand new puzzle. Is it related to the movie? Shortly after the movie trailer hit, fans were quick to notice that a Swamp Pop website does exist. Here, you can purchase the soda and other related merchandise. And it is very reminiscent of the original Slusho site. The Swamp Pop site even offers a 'long-term shelter supply' of the delicious soda. But at a price of $4,813, it is currently sold out. Eagle-eyed fans have noticed that 4813 is the number that is punched into the juke box at the very beginning of the 10 Cloverfield Lane teaser trailer. A Cloverfield Clues reader reached out to the cola company and asked about their long-term supply. Here is the response they received. "Thank you for your interest in the long term shelter supply. Due to unforeseen circumstances on the eastern seaboard we have had an interruption to our supply lines. We apologize for the inconvenience as we realize time is of the essence. We will add you to the waiting list and a representative will contact you to assess priority as soon as the shelter supply packages are once again available for purchase." While you can't order the longterm supply, you can still order soda from the site. And the ones that have been shipped have arrived with puzzle pieces. As you may remember, we see the three bomb shelter residents in the 10 Cloverfield Lane trailer putting together a puzzle. The Swamp Pop puzzle pieces have been put together, and they form a picture of the Eiffel Tower. What does the Eiffel Tower, or Paris, have to do with 10 Cloverfield Lane? We have no clue yet! 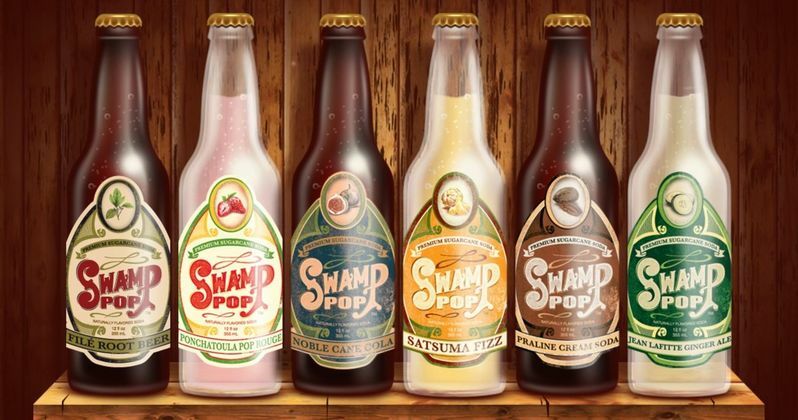 /film has since discovered that Swamp Pop is a real product, and is used as product placement in the movie. It is not a fake product like Slusho. They don't believe that the puzzle or the website is part of the ARG, but that they are just having fun. What do you make of all these?